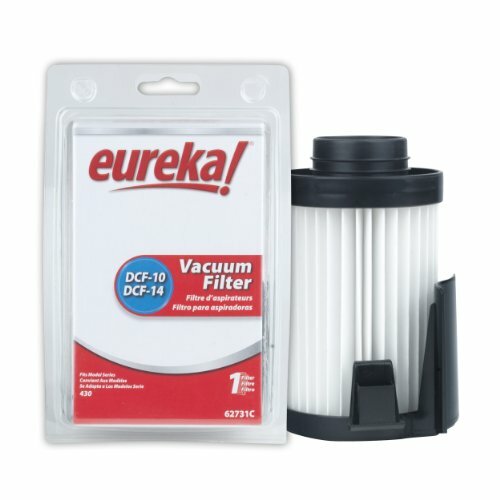 Genuine Eureka DCF-10 / DCF-14 Filter. Fits Eureka 430 Series Mini Uprights. Replaces 62731, 62731A, 62731B, 77251, and 76492. Replace vacuum filters every 3 to 6 months for optimum performance. Genuine vacuum filters are free from defects in material and workmanship. Should a defect occur, please call 1-800-282-2886 to find out how to receive a replacement. Fits Eureka 430 Series Mini Uprights. New Prolux 6000 Upright Washable HEPA vacuum with 12 AMP Motor on board tools and 5 Year Warranty!